Supporting retailers through planning solutions in OFML catalogs. With the new exchange format PEC (see also “PEC connects designer and consultant”), manufacturers can incorporate typicals into their OFML catalogs. This way, they’re not only showing individual articles, but are also able to communicate solution proposals within their commercial networks. Such planned solutions make it possible for the sales team to develop high-quality furnishing concepts efficiently and to incorporate specific product knowledge directly into their customer interactions. More and more, shared offices are giving way to open office spaces. They foster creativity, exchange – communication. These spaces, however, have one drawback: Wherever people are talking, typing and sorting papers, or telephones are ringing and printers are chirping, it can get loud. It’s not only disturbing, but it also affects performance and health. 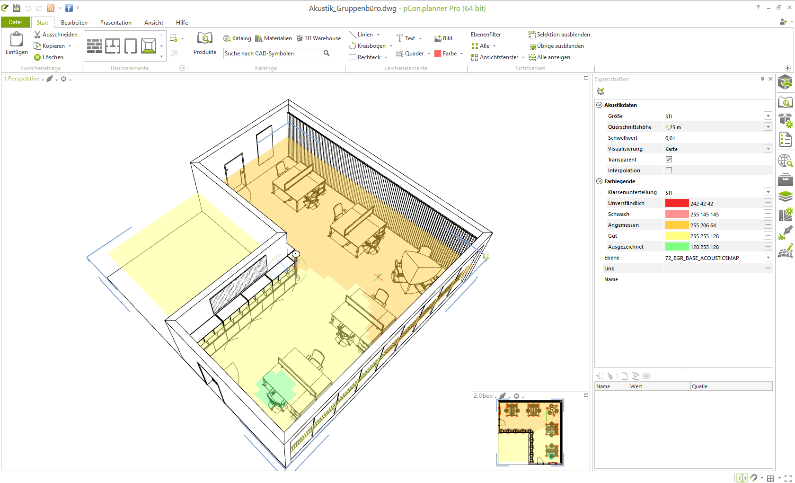 Holistic spatial planning is the solution and the pCon.planner PRO is the right tool for that task. Security flaws within Sentinel License Development Kit (LDK®) – What to do? Security experts have uncovered security flaws within the License Management System Sentinel License Development Kit (LDK®) of the company Gemalto. These have been fixed with the current version 7.63 of this tool (Sentinel Runtime Environment). EasternGraphics uses this tool for license protection reasons for some of our software applications such as pCon.planner Pro, pCon.creator and pCon.basket Network license server. The imm cologne was the beginning of an exciting trade fair year, and it is followed by the next exhibition in the coming week: the supplier fair for the furniture and interior design industry, ZOW 2018.